I’m glad to have the opportunity to thank the Japan Business Society of Detroit for your generous assistance in making my dreams of study abroad a reality. Thanks to you, I was able to spend two semesters at the Japan Center for Michigan Universities, taking high-level intensive language courses, interacting with community members, and even participating in an internship program. On top of that, I was able to travel, try lots of Japanese food, and get first-hand experience of a culture that was foreign to me. Hikone is a small town in the countryside of Shiga prefecture, but with an incredible view of Japan’s largest lake, and well-connected to larger cities by train. Every day saw me taking three hours of intensive Japanese classes, with other classes, events, and meetings in the afternoon. The amount of time I had to spend studying was probably the greatest surprise, more than any kind of culture shock or homesickness. As much I sometimes envied the students who had more free time, I know that taking difficult Japanese classes abroad did something incredible for my language abilities. I had daily opportunities to practice speaking about difficult topics, a close relationship with my teachers, and class sizes as small as two. I also had chances to use the things I learned in class in the real world. One such revelatory experience was an interview-style language exchange event in Spring semester. 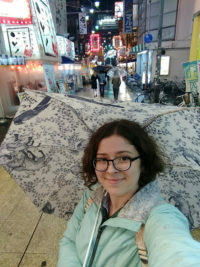 I realized, as I talked to local people about their families, Japanese history, and even social issues, that I had become as good at speaking Japanese as I’d ever wanted to be. That isn’t to say that I was particularly fluent—but that I could express, more or less accurately, whatever I wanted to without much delay. After that, interacting with Japanese speakers became so much less stressful. The exposure and immersion of study abroad is the best thing you can do for your language skills. That realization made me aware of how far I’d come, and gave me confidence in my interactions with other people. And, once I knew I could talk to basically anyone in (slightly broken) Japanese, doing it in English became easy by comparison. Talking to people like that led to some of the best experiences I had in Japan. My conversation partner, who I met once a week for most of my time at JCMU, became a good friend. We shared stories and even traveled together, to places like the Toei Movie Village, home to Toei Studio’s sets for historical films. I would never have known it existed on my own. Another friend I made was a Japanese roommate who came to JCMU for a two-week English intensive program. I was so nervous to meet her, but we ended up getting along very well. Using Japanese in my own apartment helped me grow comfortable with speaking, and it was great to be able to talk to someone my own age. I am still in touch with both of these people, and I look forward to meeting them again. what life after college could be like. Whether or not I go back to Japan, I know I will return to that state of confident self-reliance. Thank you for your part in making this experience possible for me. I have benefitted so much in my language skills, confidence, and knowledge of the world. I hope to continue to be a part of the Japanese-learning community in Michigan, and to take the skills I’ve gained with me wherever I go. I’m deeply grateful for your support and generosity.